WOW! What a night and I wasn't even experiencing it like the finalists were! 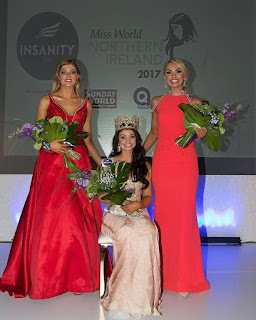 So as you all know, Monday evening was the Grand Final of the Insanity Tan Miss World Northern Ireland 2017 Contest in the stunning Europa Hotel Belfast. Firstly, massive congratulations to all of the 24 finalist for making it that far, it is such an amazing achievement on its own, you were ALL amazing and put on the best show for us, all while making it look super easy! My little sister (all 5'11 of her!) rightfully earned her spot in the grand final as she won her heat to be crowned Miss Ballymena 2017. Fionnula was shopping in Primark one day when she was approached by the ACA model scouts and asked to take part in a heat. At first Fionnula thought they were joking and said no, then soon realised they were deadly serious! I think this just sums her up to a tee, totally oblivious to how bloody gorgeous she actually is! They arrived at the Europa on Saturday morning for a weekend full of fun, photoshoots and rehearsals. Imagine being put up in the stunning Europa hotel for two nights and having the best fun with 23 of your new best friends? I wanna do it! On the night itself, we had a red carpet arrival with a WKD of choice on hand from the beautiful ACA models. Before handing over our tickets and entering the grand ball room, we were all treated like celebrities, getting papped by Local Women, Ulster Tatler and all of the local paper photographers- of course we were loving it- even my Daddy who is NOT a photograph kind of man at all! Taking our seats we were presented with a goodie bag filled with loads of treats such as a bottle of the amazing Insanity Tan, a bottle of WKD, and a voucher for the Make-Up Pro Store in Belfast! All 24 finalist started off with a dance on stage to get the show started and it really did just that, it was so up beat and fun to watch them all come out and strut their stuff, I know how scary that first walk out must have been- especially in them short shorts, but wow girls you nailed it! Next up was a short description of all girls as they walked in threes down the catwalk in their BIKINI!! YES! You heard right, their bikini- I would have died off having to do that and most people would have too but they took it in their stride and absolutely rocked the show, every single one of them! Their tans were literally flawless, and I am not saying this just because Insanity Tan are a sponsor or anything, you guys know from my blog post a long time ago before Miss NI how much I love this tan and Monday night proved that, not a streak in sight on any of those girls and it is now Thursday and Fionnula is STILL glowing! I applied my own tan using the shade Ultra Dark on Saturday afternoon and it is still holding up too, I'm so in love with this stuff! After an amazing catwalk show showcasing all the beautiful stock from none other than Blush Boutique, we were straight onto the Evening Wear, where the girls came out in groups of 5 onto the stage and then individually walked down the catwalk, whilst Zoe Salmon read a description of their dress. Then suddenly, we were into the Top 10! It all happened so quickly, after our amazinggggg dinner it seemed to fly by. There were 9 categories to be announced and a judges choice which made up the final 9 girls, as the beautiful and talented Eden McAllister won 2 categories! Very quick after this, it was whittled down to the Top 5, and at this point our whole table were beside themselves, we couldn't believe that she had done this well- now we didn't doubt her for a second, but from standing in Primark to 2 months later being on stage as part of the Top 10 in the Miss Northern Ireland Final was insane! Alison Clarke, the main women - who by the way completely slays at life herself, did you see her figure in her monochrome dress?! The stunning Emma Carswell came onto the stage to crown the Top 3. The whole room was completely silent at this point, and to add some extra tension they played some dramatic music, it was class! 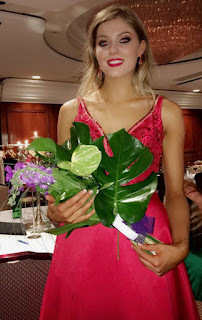 Fionnula was placed 2nd Runner-Up (3rd), which is an unbelievable achievement and we could not be more proud of her, she represented herself, Ballycastle and us so so well on stage and throughout this whole process. This was totally out of her comfort zone before all of this, but now it is like second nature to her, she is so amazing at it and I for one cannot wait to see where she goes from here! You know I will be your number one fan. Our family is so close at the best of times, so getting to share experience with her was amazing, you couldn't get two prouder big sisters, parents or boyfriend right now! Another huge congratulations to this years 1st Runner-Up, Rachel Jones, an absolute doll inside and out, well deserved. And finally our winner and newly crowned Miss Northern Ireland 2017, Miss Anna Henry. 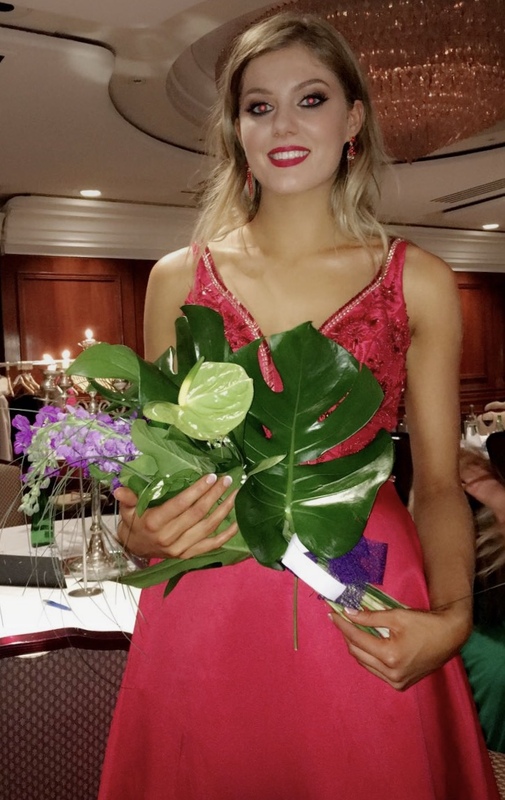 I cannot wait to see you at Miss World in China representing Northern Ireland, well done! So many of you guys asked me when I posted a picture where everyones dresses were from, so I've linked them all below! My girls are probably most deffo going to kill me for posting pictures of them on here, but everyone looked amazing so I had too - don't shout girls!! Sinead's green number was from her little sister and looked perfect on her, it looked like it was made for her it fitted that well, and how well does she suit this colour of green? Nicolas slinky coral dress was from Blush Boutique and showed of her amazing figure so well, loved this colour on her with her tan and hair colour! Ciaras cute mint green dress was by V by very, and her bag was from Ted Baker a couple of season ago, but matched so well, Ciara really suits these lighter colours, who would believe she is the oldest sister?! Very have some amazing selections of dresses to choose between and are so well priced, Ciara's was £70. So many people don't think to shop here, This Morning always showcase clothes from here and this is how we found our love for it! My grey number was from ASOS but by a brand called TOFS and was only £50! An absolute bargain I thought, it can be worn in so many different ways so I think this will be worn again, my bag was from TK Maxx and was only £15. Of course my tan was the Ultra Dark from Insanity, as was Nicolas and Ciara's. The boss man himself Benny O' Kane from McGills styled both mine and Ciara's hair to perfection as always at 9am on Monday morning and they were both sitting perfect at the end of the night! went so perfectly throughout the night, from the moment we entered the Europa Hotel to the moment we left. So a huge thank you to everyone at ACA Models. Another thank you to everyone who messaged me on the night on Snapchat or Facebook to congratulate Fionnula, she is so thankful that you lovely lot took the time to do so!